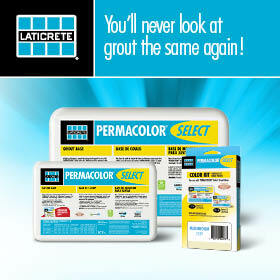 LATICRETE has introduced its new LATAPOXY® BIOGREEN™ 300 – the industry’s first high-strength, chemical-resistant epoxy adhesive made with bio-based material for installing tile and stone. Designed to provide an alternative to conventional non-renewable petroleum-derived products, LATAPOXY BIOGREEN 300 may contribute LEED V4 points and retains the same easy-to-trowel consistency of LATAPOXY 300 Adhesive, with the additional enhancement of a faster cure time. Equipped for the most demanding installations of tile and stone, LATAPOXY BIOGREEN 300 exceeds both ANSI A118.3 and ISO 13007 R2 requirements for epoxy adhesives and can be used in interior and exterior areas such as walls and floors, wet and dry areas. 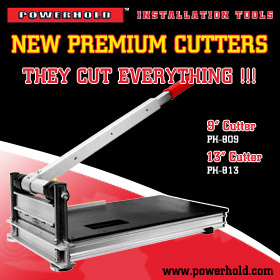 “With a faster cure time, contractors gain increased productivity and time savings on the jobsite, with a faster time-to-grout and heavy traffic permitted in just 12 hours,” added Scott. The bio-based epoxy adhesive can be used to install a variety of ceramic tile, marble and natural stone, and will bond to most sound, clean surfaces, spreads easily and can be cleaned with water while fresh. 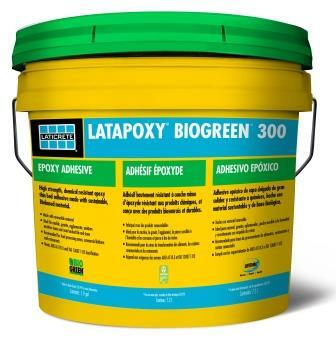 LATAPOXY BIOGREEN 300 is offered in the same packaging configuration as LATAPOXY 300 Adhesive, which will continue to be available. 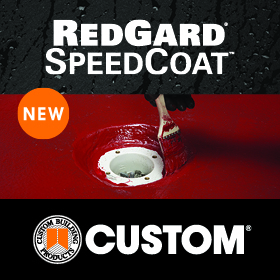 Coverage for both products is the same and both are components of the LATICRETE Lifetime System Warranty providing one source, one warranty from the substrate to the grout.